The Dave Rawlings Machine played the Paradise Rock Club on Commonwealth Avenue in Boston this Saturday night. It was two sets followed by two encores, and we were lucky to get back across the river to Cambridge by midnight. The band is a new incarnation for Dave Rawlings and Gillian Welch, who have been performing together as Gillian Welch for more than 15 years. And the show was a homecoming of sorts as both trained at Boston's Berklee College of Music in the early 1990s. The Dave Rawlings Machine is a band won't sit still for a picture, even during the second encore at the Paradise in Boston. 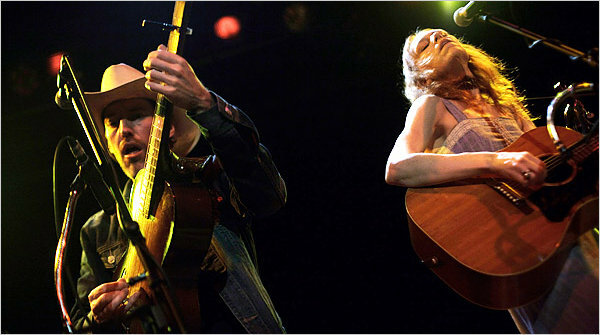 Dave Rawlings and Gillian Welch performing at the Bowery Ballroom in New York City. Those who come to hear Gillian Welch are bound to be disappointed. We found the Dave Rawlings Machine to be happy and high energy, whereas Gillian Welch will slowly rip your heart out every time. We will admit that Dave is a better backup singer for Gillian than Gillian is for Dave. But the ensemble pulled together some crowd pleasing covers such as This Land is Your Land and The Weight. And the lyric "To Be Young, Is To Be Sad, Is To Be High" is well on its way to becoming an anthem for the alt-country Americana crowd, judging by the audience sing-along. And there was a lot of candy to go around with Big Rock Candy Mountain, Sweet Tooth, and a third song that went on forever and whose name is a little sticky in my memory right now. You can get your Sweet Tooth filled by running out and buying A Friend of a Friend. The group singing sweet tooth at the Delfest in Maryland last weekend! Going to see them again this Tuesday at the 9:30 club in DC. WHOOT!